In 2017, it was estimated that more than 51 million Americans flew during the 21-day holiday season. If the airport lines and traffic jams weren’t already enough evidence, the holidays are the busiest times to travel throughout the year. Chances are, you’re going somewhere for the upcoming holidays, whether that’s flying across the country or even driving an hour away to Aunt Linda’s house. Packing the right outfit and toiletries are of course important, but what many people experience (though aren’t fully aware of) is the toll that travel can have on your skin. When you’re trying to remember everything to pack, our skin care items and regimen can quickly be thrown to the wayside, leaving us with some blemishes, breakouts, and bad feelings once the holidays slow down. But you can prevent all of this with ease with the help of your favorite dermatologists at Azeal Dermatology in Boulder. We’ve compiled a list of holiday traveling essentials that are designed to help you (and your skin, too) during the busyness that lies ahead. Learn more from Azeal Dermatology, and make an appointment with us to give your skin the treatment it deserves. Certain destinations are more in need of sun protection than others (think deserts in Arizona and mountains in Colorado). If you’re going to a place this holiday season where sun exposure is to be expected, it’s best for you to pack a great sunscreen that won’t clog your pores. Even if you’re not going somewhere like this, you can knock two things out at once for your skin care routine by bringing a moisturizer that has SPF. Protecting from harmful UV rays is most beneficial for preventing skin cancer, but it also can prevent wrinkles and sunspots as well. Did you know that planes have 0% humidity? This can lead to your skin drying out, which leads to a bevy of other skin-related issues. Having the right moisturizer on hand is crucial for helping your skin maintain some sense of normalcy as you’re traveling. 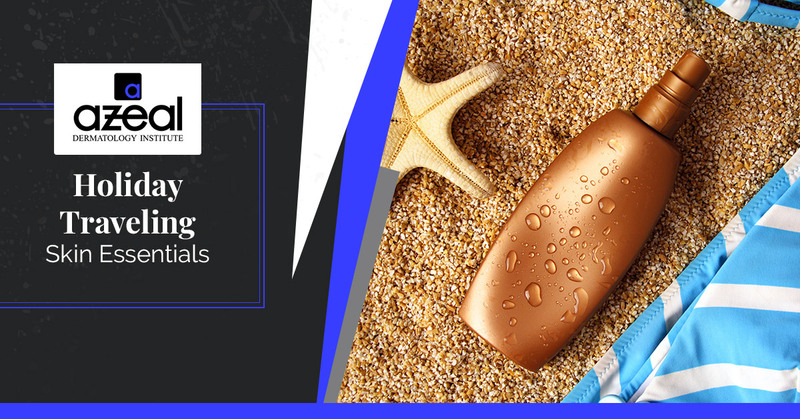 As we mentioned, make sure you choose one that also offers sun protection, and if it’s in your carry-on bag, make sure it fits the proper size regulations. Chances are, you’re going to be taking lots of pictures and looking fancy for at least some of your holiday functions. Wearing makeup is more than fine, but you have to be able to fully remove it to allow your skin to breathe. Otherwise, clogged pores can lead to breakouts, which no one wants to deal with (especially around the holidays when you’re seeing so many people). Find an oil-free option to further protect your skin, and look into travel-size makeup removers that take up less space in your bag. It might seem silly, but when so many things in our routine fluctuate during the holidays, we often forget to do some of the basic things that make us feel good. When you have a water bottle on hand, you’re much more likely to drink water consistently than if you were to otherwise search around and ask your guests for a glass. Staying hydrated helps our skin perform at its best, and when we’re traveling a lot, we need to stay hydrated more than ever. Just make sure that you dump out your water bottle before you go through airport security! Many women take birth control to solely control their acne, though there are plenty of other prescriptions that can help people better manage their breakouts. Others who have various types of dermatitis (eczema being a common example) should definitely bring their treatments and supplies to help combat flare-ups or keep them at bay. Prepare for the worst, hope for the best, and continue your prescriptions as necessary. We know what you’re thinking: Why pack healthy snacks when there will be so much delicious food available? We completely get it, but hear us out — for as rich and divine as those amazing holiday meals are, they’re not what we’re used to. Disruptions in your diet can absolutely affect your skin and lead to some less-than-positive results. Even if it’s just bringing carrot sticks for the drive or the plane ride, this is a great way to continue balancing out your diet, which helps your skin stay balanced, too. We’ll cover this in a later blog, but the holidays can be very stressful for many of us. As fun as it might be to see so many family members, it can also cause a lot of stimulation and anxiety. For millions of Americans, not being able to spend the holidays with the ones you love is also an understandable form of stress. Our dermatologists want you to be free of stress during the holidays for your own mental well-being, first and foremost. But stress can also lead to a lot of skin problems; for some people, stress that leads to skin problems also leads to picking at or irritating their skin problems, which cycles back to even more stress. There are some great ways to try and relieve some of that stress (which we’ll cover in our next blog! ), but in the meantime, think of something that you can pack that’s small, but mighty in stress relief. Books are a perfect way to escape, as is coloring. Journaling is a mental release for many of us. Even just having your smartphone set with some soothing playlists can help you decompress. Ideally, you should try out some of these stress relievers before you travel, so you know what works for you. 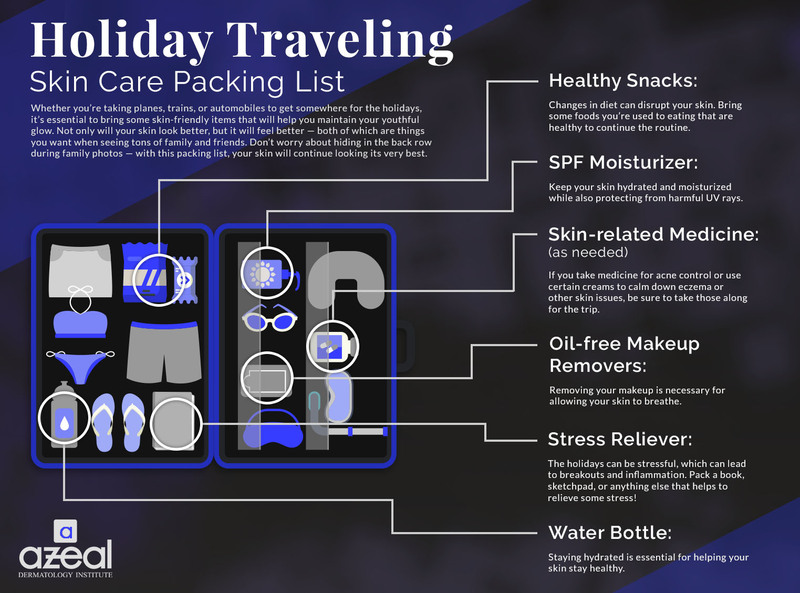 No matter what the outcome for your skin is after your holiday travels, our dermatologists at Azeal Dermatology are here! Your skin could be glowing or struggling, and there will still be exceptional cosmetic, aesthetic, and general dermatologic services at Azeal Dermatology that will enhance your skin even more. Contact us today to set up an appointment, and don’t forget to pack for skin success this holiday season.